In 2018 our team went to Lesbos, Greece. 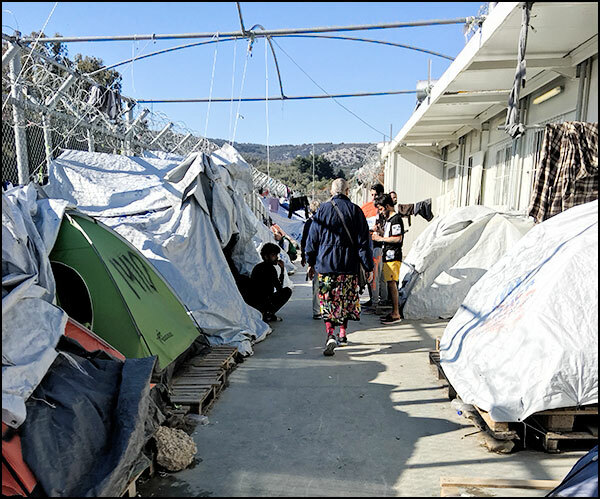 We provided medical care via a mobile clinic at the UNHCR Moria Refugee Camp. We are returning in October 2018, and are looking for volunteers with various skills. 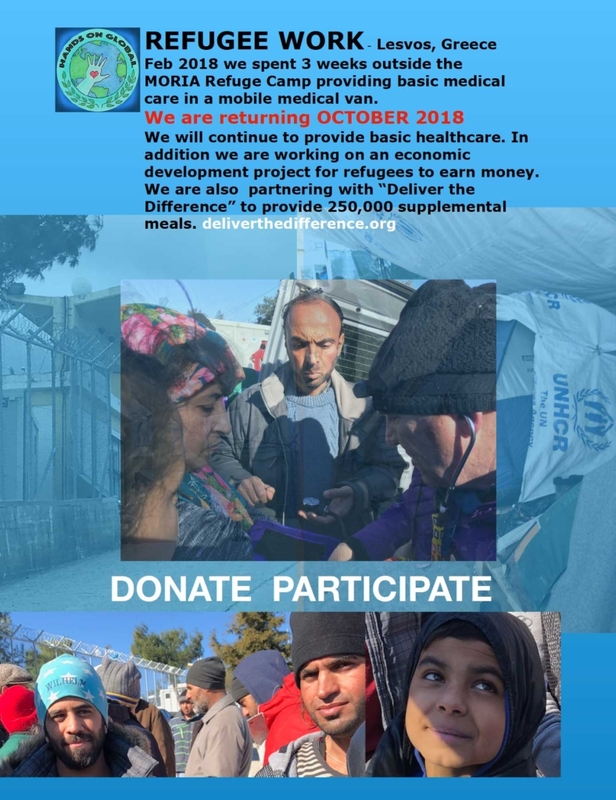 See flyer below for information on our October 2018 trip to Lesbos, Greece. Our refugee work continues. We feel it is the most critical global humanitarian crisis of our time. 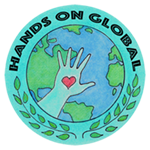 Hands on Global will be returning to Lesvos Greece in October 2018 to bring medical care to refugees. We are thrilled to be partnering with DELIVER the DIFFERENCE a Florida based ngo to ship 245,000 Halal, non-GMO meal packets to refugees on Lesvos. These meals are meant to be supplements but we know from our experience working in the refugee camps, food runs out. People go hungry. We met a young Syrian father on the road late one rainy night out searching for food because his children were crying with hunger. These meals will make a huge difference feeding children and adults. 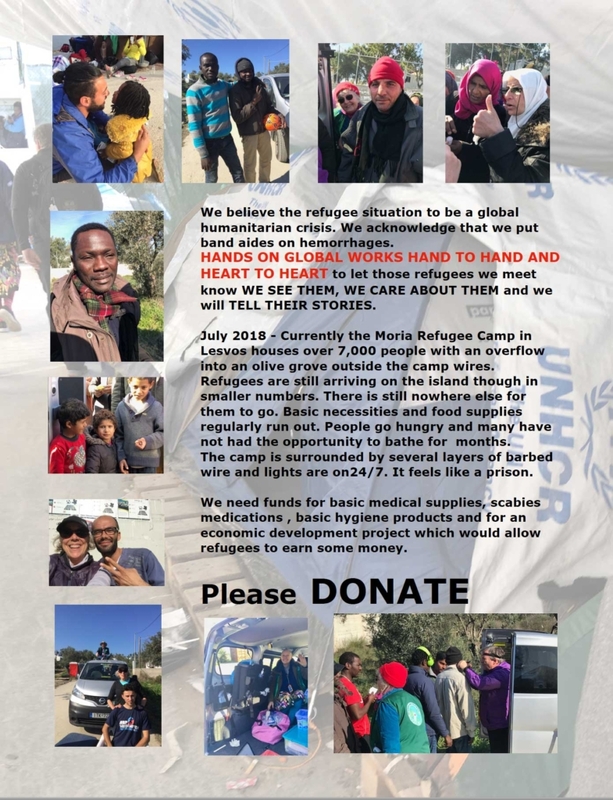 Hands on Global and Deliver the Difference are working with the on-the-ground NGO, Refuge4Refugees where these packets will be delivered to their warehouse and available for distribution. We expect to be on the ground in Lesvos to receive the container of food. Please consider sending donations to http://www.deliverthedifference.org/donations so no refugee child cries with hunger. That no refugee adult silently suffers from hunger. We can change this by working hand to hand and heart to heart.